We have been serving very discerning customers and avid guitar collectors since 2004. We are now an Online-Only music store. FYI : For our AXN™ Guitars we pick with our own eyes the best woods, generally AAA grade timber, purchased from local USA suppliers. Every detail and specification of our guitars are researched with extreme scrutiny. We don’t cut corners in anyway. We use only German made Floyd Rose Products. 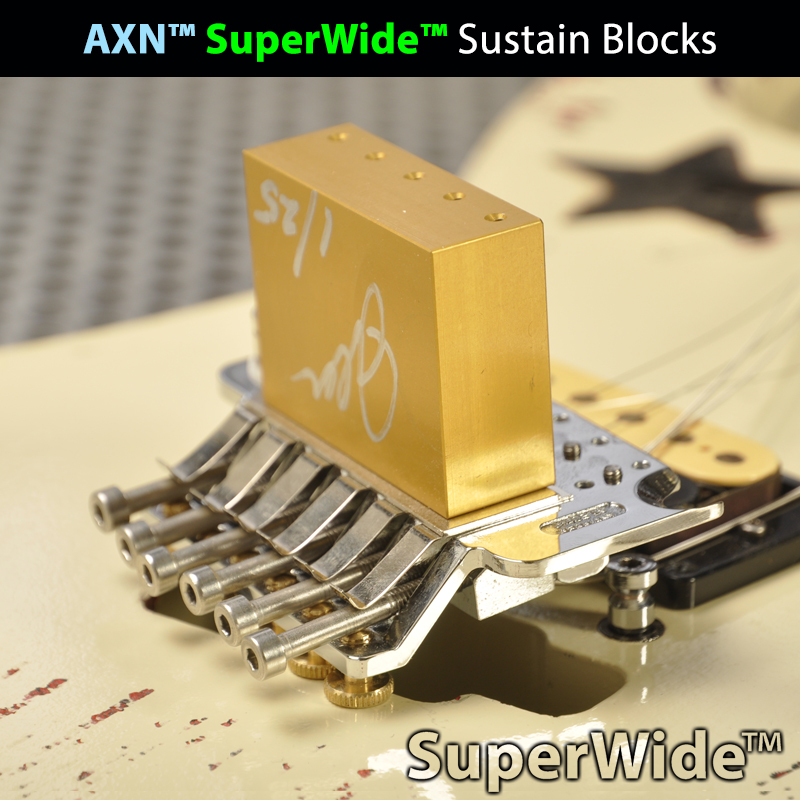 We custom manufacture AXN™ Sustain blocks and other hardware used on our AXN™s which are manufactured for us locally at an aerospace machine shop in California USA. We have personal relationships with employees and production managers from the pickup makers that you prefer and communicate with those brands including Bare Knuckle Pickups when we special order pickups for our AXN™s. Since 1984 I have recorded, documented and examined in person, and from professional experiences confirmed to 100% exactness various guitars used by some of your favorite 1980s players. I have on hand technical notes and exact measurements recorded by myself and friends that are still working in the music industry as professional touring guitar technicians that reveal secrets of certain guitars. In some instances my records and hand written notes are near to 30 years old. I have in my possession scientific data revealing the exact neck shapes and neck/fretboard details of certain guitars. As well, the same data documents the neck radius, fret sizes, types of woods, paint formulations and complete guitar specifications of certain guitars that are of interest to many musicians. We also used commercial machinery to reveal metal types used in for example the sustain blocks used on the first Floyd Rose locking tremolo. We’ve used this data to create our premium AXN™ Guitars. In other words, if your considering an AXN™ Guitar it will most likely be an instrument that sounds and performs better than anything you have ever played. In every case an AXN™ Guitars exceeds by far the quality, craftsmanship and attention to detail of any mere production line guitar of the past and from today in any price range. I would venture to say that the instruments that we manufacture that resemble 1980s iconic guitars are superior and of a much much higher grade than even the best signature guitar or vintage brand you’ve loved from that time.